The Ex-Servicemen Contributory Health Scheme board very recently announced the official Telangana ECHS Recruitment Notification for the Medical Officer, Safaikarmachari, Chowkidar, and Other Posts. So, the ECHS means as Ex-Servicemen Contributory Health Scheme and the placement location will anywhere in Telangana State. The main location also in Telangana only. The candidates who are looking for the jobs in Telangana State this notification is so helpful to grab. The selection process will be like on written test and Personal interview, the applied candidates have to start the preparation for the written test why because the selected candidates in written test will go for the next rounds of the interview. For latest Central Govt Jobs, you can check on our page. The candidates who are searching for the Telangana State jobs can get on our page. 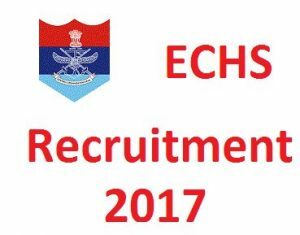 so, we are coming again with Telangana ECHS Recruitment Notification 2017 the links are placed in the bottom of the page. The ECHS board wants to recruit the willful applicants for the Medical Officer, Safaikarmachari, Chowkidar, and Other Posts to give place for the remaining 77 Posts. The candidates should know this the application fee is applicable for more to know refer the official notification. By following our page, you will find the eligibility details like educational qualification, age limit, pay scale, selection process and steps to apply for ECHS Jobs. Already the applications are taking now, we advise the candidates who are interested can go to the vacancies notification. The postal address is clearly mentioned in the below article, For more Latest Exam Results, you can download on this page. For the details of Qualification, participants should refer the Official Advertisement which is uploaded in the below sections. Selected contenders will be paid a Pay Scale as per the norms of Ex-Servicemen Contributory Health Scheme. To know the further details of Salary, applicants are advised to go through the Official Notification. Authorities will first conduct a Written Examination to shortlist individuals for further rounds. Candidates who clear the Written Test need to attend for Personal Interview. The final appointment will be granted to the aspirants depending on their performance in both Written Exam and Interview. Delhi Cantt – 110 010.